FROM THE LAB: Our introductory pricing is ending soon, so we suggest you prepay for any courses you want to take in 2016! And Follow us on Twitter at @VControlLab!!! It’s been a hectic December, but we’re back at it and looking forward to an exciting 2016! With NAMM around the corner, you can expect a ton of major Eurorack and modular news in the next month or two. We’ll be at NAMM, where one of the products we’ve been closely following will be on display, the new Varigate 4 from Malekko Heavy Industry. You may recall we discussed the Varigate 4 a couple of months ago, before it had a name or panel design. Now the module has been completed and will be on the way to stores soon. 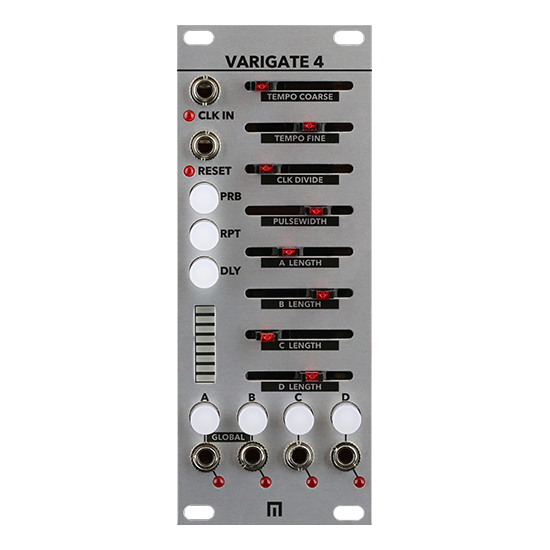 The Varigate 4 is a 4 channel, 8 step gate sequencer, perfect for drum sequencing and live jamming in a modular system. The module includes independent control over Probability, Repeats, Delays and Step Length for each of the 4 channels, as well as global control over the internal clock (with a range of 30-225 BPM), clock division and gate pulsewidth. The module includes an external clock input to sync with your existing patches, and a reset input to trigger sequences to restart. By using the 3 illuminated buttons on the left side of the module, each step on each channel can be assigned probability that the step will play, repetitions per step up to 8 (essentially acting as a per step clock multiplier) and delay per step (to introduce complex shuffles and beat timing). When seen in action, these 3 controls can have dramatic and musical effects on a beat, introducing another option for algorithmic drum and pattern programming (a personal obsession of mine). The Varigate 4 is the brainchild of Ben Davis, a new module designer from Detroit, Michigan. I’ve followed the modules development for these past few months, and even now, Davis is tweaking and finalizing the code. Responding to requests on the Muffwiggler forum, Davis added a preset saving function. If the Varigate 4 is any indication, we should be seeing a lot more from Davis and Malekko. What other modules will pair well with the Varigate 4? Tell us in the comments! We’re closing out the year with introductory pricing on all our courses! Enroll now!